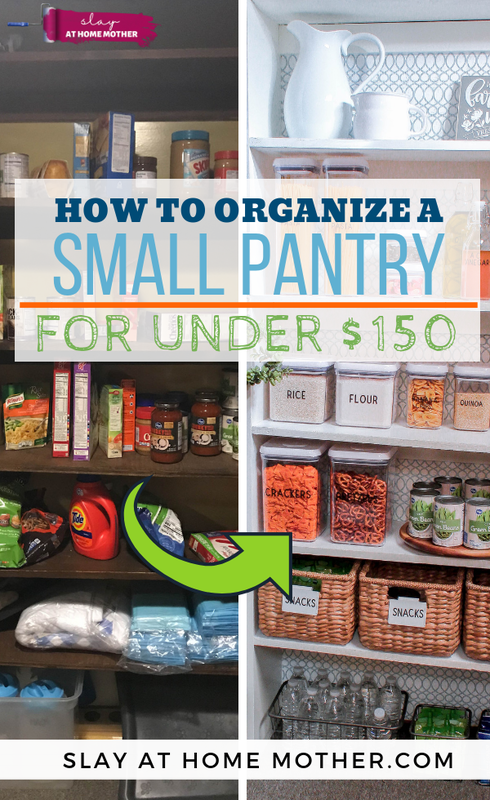 Need some help organizing your small pantry? I recently updated my basement pantry using paint, contact paper, baskets, and airtight containers for a bright, beautiful, and organized feel! I’ll show you how I did it, and show you how to get the look for less! Anyone else move into their ‘starter’ home, only to discover they’d be living in it for more than a few years? Such is true for our family. My husband and I purchased our home together in 2013 and thought for sure we’d have moved by 2015. It’s now 2018 and we are still here. After a hip replacement, adding a new baby to the mix, and several job and career changes for both Chris and I, it’s easy to see why we haven’t moved just yet and how busy life has kept us. But that’s all changing. 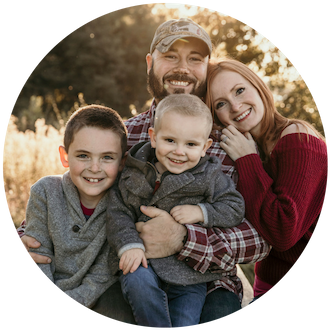 As we are currently trying for baby #3 and attempting to get our home organized to house three little ones, Chris and I have decided that we want to change things up in our home, and are going to be doing a lot of home projects this year. 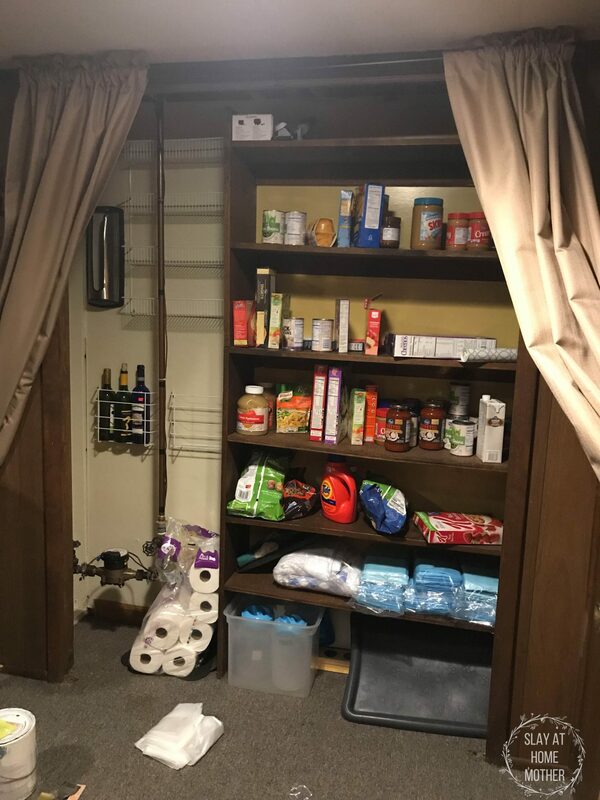 Our pantry included! Our pantry is one of the areas that lacks imagination, design, and organization. I actually can’t stand it, and maybe that’s why I’ve neglected it so much. It is dark, dirty, dingy, and plain ugly. We had beige curtains hung up, random items scattered across the shelves, and everything was either a shade of brown or a shade of yellow. BLEH. The brown and yellow was just gross feeling. We also had things we haven’t used in years like puppy training pads, wine bottles, fabric, dog food canisters, and other random items. Looking at our shelves, it seems as though the previous owner either built them herself, or she simply stacked two strangely-made bookshelves on top of one another. I can’t be sure, but I will say that I thought about tearing them off of the wall completely and starting fresh. 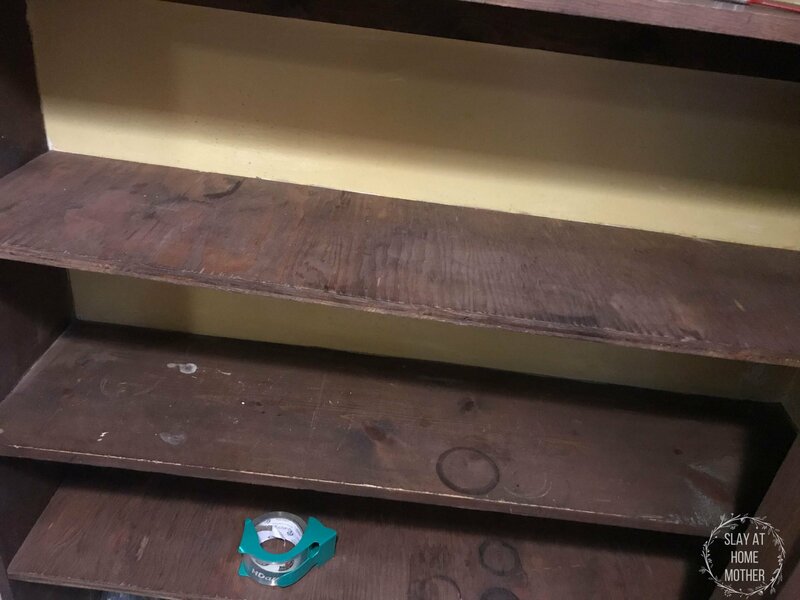 Unfortunately, I would have needed four burly lumberjack men and a few crowbars to remove these shelves, so my little remodeling project would need to include them. Did I also mention the oddly placed water pipe in the middle of our pantry? Odd, just odd. 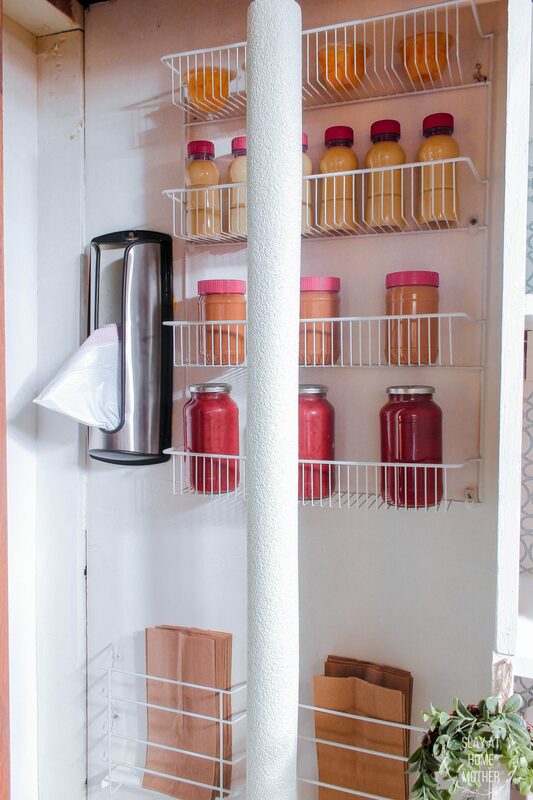 For my Pantry Refresh, I collaborated with a local interior designer, Orna Fathers of Grace This Space. She has a real knack for organizing and also has the cutest Australian accent ever. I sent Orna a photo of my pantry as it was (in all of its eyesore glory) and told her my design plans and how I wanted to transform it. We both agreed that it needed a brighter feel. 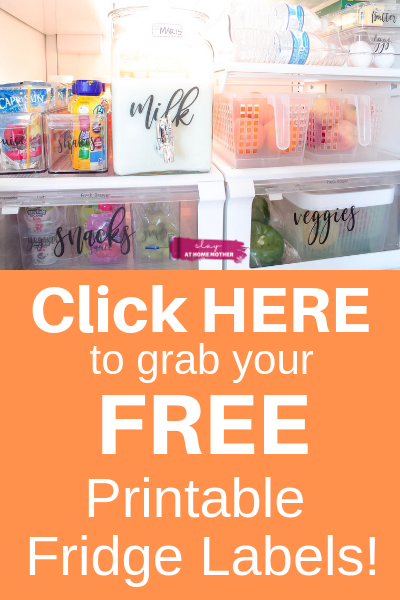 In this post, I’ll share all of the organizational supplies I used, as well as some cheaper alternatives so you can accomplish this same look for less! When it comes to your pantry, consider the items you will be storing. WIll you be storing tons of cans, boxes, fruits, vegetables, dried goods, or all of the above? 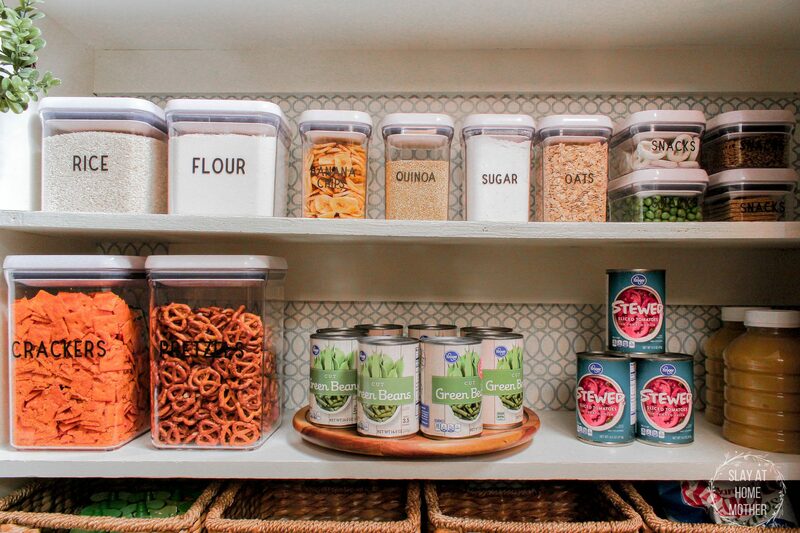 Before purchasing pantry organization items, think about where you’d like to store certain foods, if you’d like to label foods, and your budget. While everything on Pinterest looks gorgeous and dreamy, it may be put together using a budget that is larger than the one you have. Work with what you have! Also think about items you already have. Perhaps you have ten extra Easter baskets that your children no longer use – you can cut the handles off those baskets and use to store pouches, sauce packets, etc. If you are on a tighter budget, you may want to keep the original packaging on most of your dry goods (like pasta, flour, sugar, etc), which can save you money because you won’t need to buy dozens of glass jars or containers to transport food into. 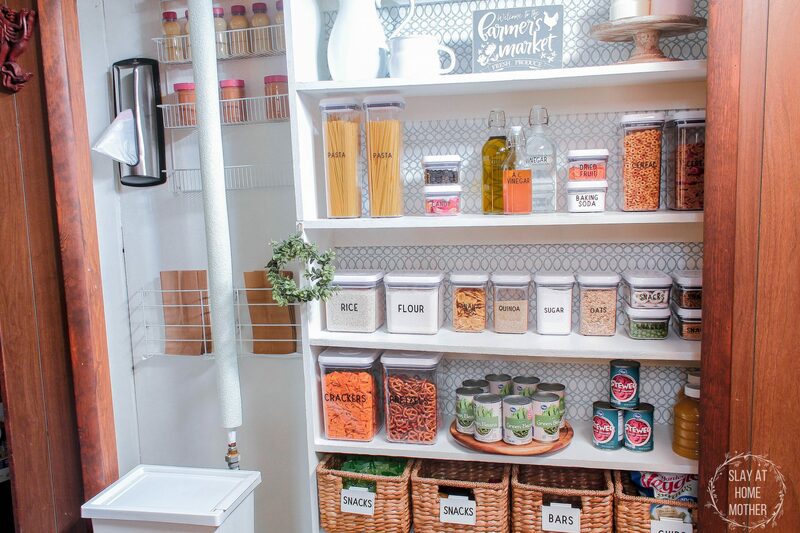 If your pantry has doors, grab an over-the-door organizer to maximize the space in your small pantry! You can store cans, spices, lunch bags, trash bags, paper towels, and any other extras you might have in these organizers. These organizers often feature 5+ shelves and can be purchased for around $20 or less. If you have a lot of space between your shelves, consider using an expandable shelf insert. They divide your shelf’s vertical space in half so you can pack more pantry necessities in while using all of your available space. I planned to use my new turntable for cans, the baskets for snacks for our boys, and the OXO containers for our dry goods and pasta. To give my pantry a lighter, brighter feel, it was time to get rid of all the brown and yucky yellow. Because I couldn’t rip out the handbuilt shelves, I had to make it work, and decided that painting was the best way to go! For the shelves, I purchased some plain white contact paper so I could easily slide my baskets, containers, and cans without worrying about chipping the paint. I already had some leftover white paint from painting the boys’ dresser earlier this week, so I didn’t need to purchase paint for this project. Before you buy paint for this project, if you decide you need to at all, look through your old paint cans and see if there’s a color you wouldn’t mind using to brighten up your pantry! if you have enough, and it’s a pretty enough color for your liking, it might be the right choice for you and can save you some money. To start with my pantry refresh, I removed everything from the shelves and wire racks. 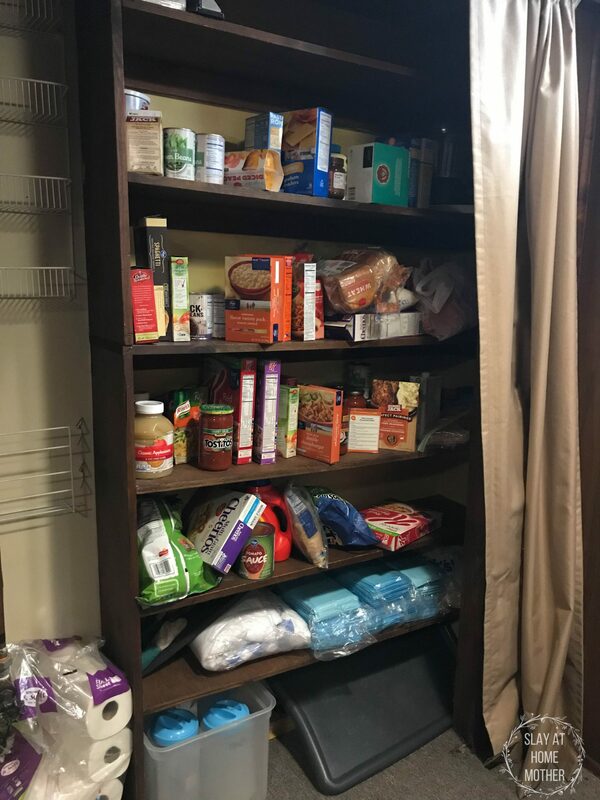 I got up close and personal with my pantry shelves – and was really happy that I chose this to be my first project towards organizing my home. My pantry desperately needed attention and a facelift. I went through all of the items in my pantry and organized them into groups. I also took note of expiration dates and threw out all of our expired food. I was holding onto so many expired cans and boxes that I had no clue were even there! You can see with this close up that my shelves really needed some paint! After removing everything from the shelves, I ran a microfiber cloth with all-purpose cleaner over the shelves to remove any dust that had formed on the shelves so I could paint. I painted all of the shelves, walls, and shelf supports white using a paintbrush and roller. Now, it was time for paint and faux wallpaper! 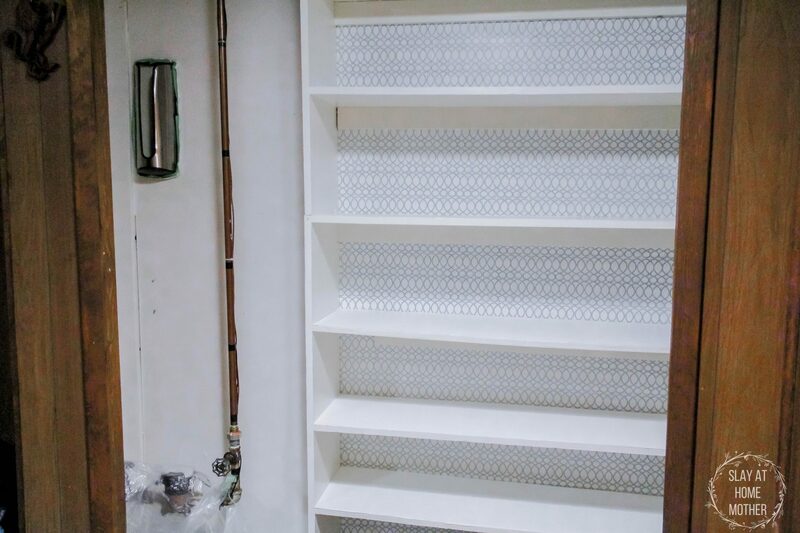 Because wallpaper can cost more, I decided to go with contact paper for our pantry refresh! At around $5.99 a roll (18″ x 20′), it was the perfect solution for us. I used plain white contact paper for the shelves and printed contact paper for the walls of the shelves. I applied the contact paper to the walls of the shelves, cutting away the excess material with a razor. 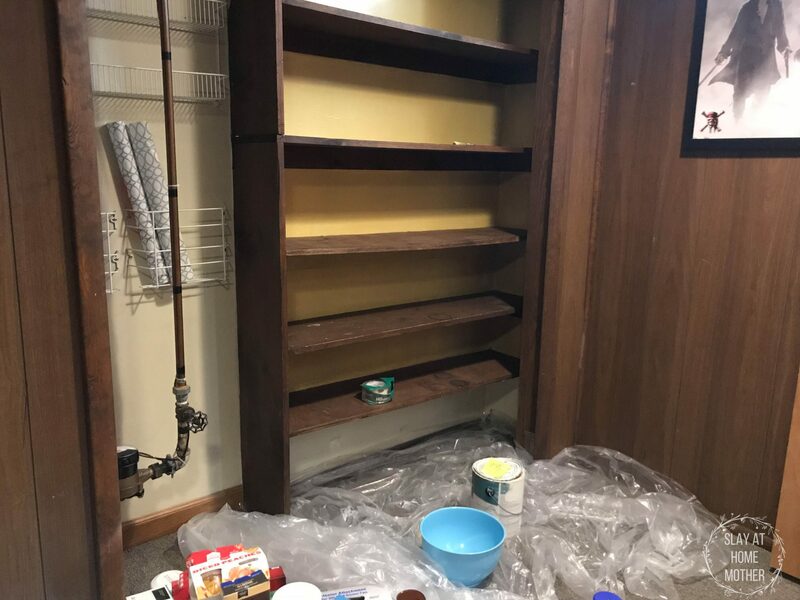 After painting and applying the contact paper, our pantry looked ten times better and was ready to store food! For the water pipe that sticks out in our pantry, my husband Chris spray painted a foam pool noodle with white spray paint, cut a line down the middle vertically, and fit the noodle around the pipe. Luckily, this pipe is not a hot water pipe and only works to provide cool water to the water hose on the side of our home. If it was a hot water pipe, we wouldn’t be able to get away with this. I transported all of our dry goods (pasta, snacks, beans, cereal, sugar, flour, crackers, etc) into airtight containers, organized the kids snacks into the baskets, and organized our cans to go on the turntable on one of the shelves. Orna from Grace This Space came over and graciously helped me organize my containers, food items, and kids snacks into an easily accessible organization system that works for my family. 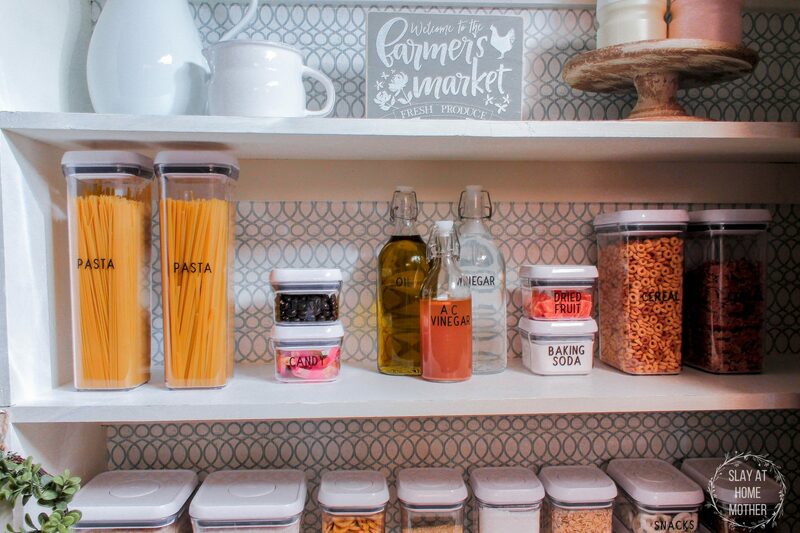 The OXO POP Containers look clean (especially with Orna’s custom labels she crafted for me), and help give my pantry that beautiful farmhouse feel I was going for. I also discovered a skylight adjacent to our pantry that my husband had blocked with some pillows for his basement theatre. Look how much light I have downstairs now! 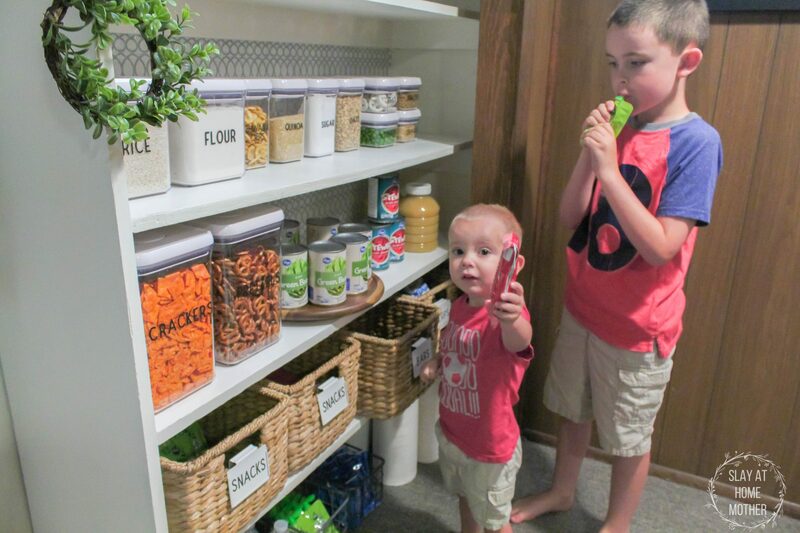 For the kids, the four baskets (here’s a cheaper alternative) on the bottom shelf contain all of their snacks for easy access! My boys can reach into one of their baskets and grab a treat whenever they like. The sweeter treats are kept up on the top shelf to discourage them from wanting those as much. My labels were custom crafted by Orna and her Cricut – aren’t they gorgeous? I love the ways labels make a pantry look and feel so organized! custom vinyl stickers (these cost more, but you can find some customizable pantry labels for sale on Etsy). If you’re more of a visual person, check out the vlog I created that shows just how I transformed our pantry into a bright and organized space! 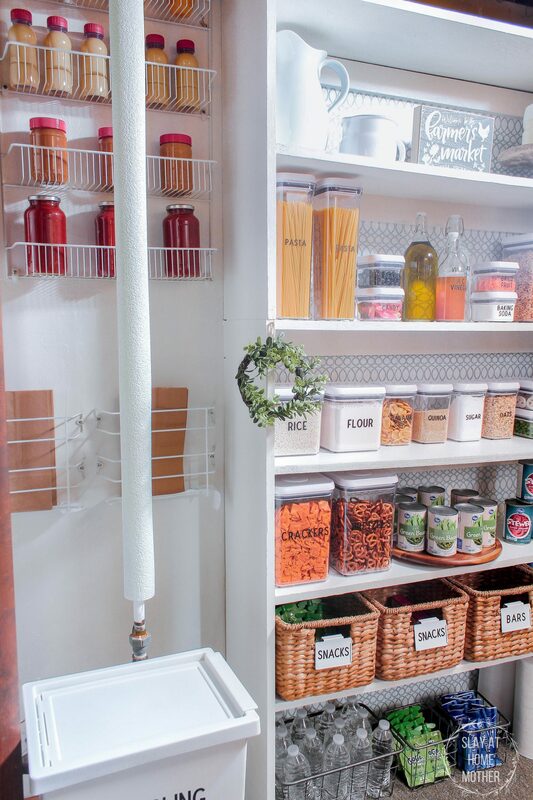 I love my new pantry, and was so happy to collaborate with Orna from Grace This Space! If you are in the Metro Detroit area and need a helping hand or a special eye for design that you might not have, I highly recommend Orna! 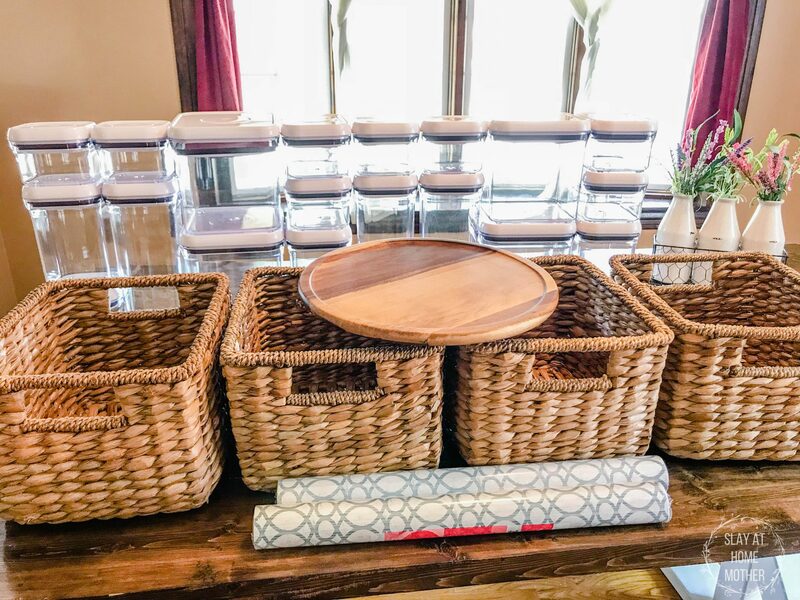 She made the process so easy and even shopped for some of my organization and decor items pictured here. She also has experience working with OXO Containers, and uses them in many of her pantry designs, as they are great airtight containers! Thanks, love – you did an incredible job tying everything together for me! I love how bright it looks! I really need to reorganize my kitchen! Thank you! I love the extra sanity I get from being more organized! I love this pantry!! So organized, now I am motivated to get mine done! 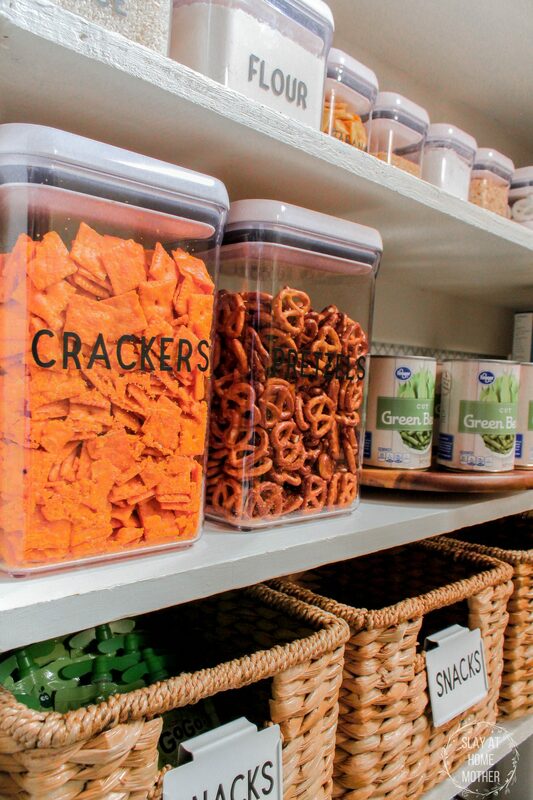 That’s the pantry of my OCD dreams!!! So organized and so beautiful!